Members will receive advance notice about special programming in their categories. We are especially pleased to invite Smith Family Leadership Circle members to a series of Board of Trustees Content Briefings on the five categories for their input, as well as to special events and other key gatherings of DPTV supporters. Members’ names will appear in on-air announcements recognizing their program category support, if they so choose. In addition, Smith Family Leadership Circle members are welcome to visit us here at the Riley Broadcast Center and meet with the President and other key staff. 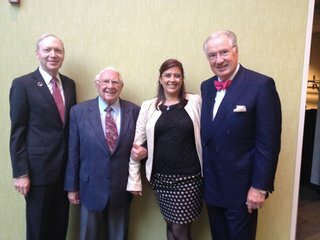 Pictured at the Governor’s Awards ceremony: Dan Alpert, Bill Smith, Jenna Moritz (DPTV major giving officer), and Dana Locniskar (Board Eme William H. Smith, whose sustained support of Detroit Public Television has helped build DPTV’s production and broadcast facilities and create the Smith Leadership Circle, was recognized as one of the State of Michigan’s heroes of philanthropy June 29 when he received the Russell G. Mawby Award for Philanthropy from Governor Rick Snyder at the 2015 Governor’s Service Awards. The award, named for the founder of both the Council of Michigan Foundations and the Michigan Nonprofit Association, encourages private action for the public good through philanthropy. That’s what Bill has sparked for many organizations, including the Community Foundation for Southeast Michigan (CFSEM), the DIA, Mosaic Youth Theatre, Michigan Infant Mental Health, WRCJ, DPTV, and others. “To see him recognized properly and celebrated by his family, friends, and representatives from all around Michigan’s generous giving communities felt absolutely right,” said Dan Alpert, Sr. VP, Philanthropy for DPTV. For information on joining the Smith Leadership Circle with a gift of $10,000 or more, please contact Dan at 248-305-3702 or alpert@dptv.org. When Patricia M. and William H. Smith moved to Detroit in 1960 from Chicago, they brought with them their family’s long-time commitment to local education, arts and culture. Fast forward to now, Bill recently established the William H. Smith Family Leadership Circle with a $1million challenge grant to encourage the sustained support of leadership-level donors wanting to commit $10,000 or more annually to DPTV and five very special donors to name the major categories of programming at $200,000 each for five years. Bill Smith founded Allied Film & Video in 1960 in Detroit to serve the growing market for educational and corporate training films. He sold the company in 1995, and Bill and Patsy established their own private charitable foundation. 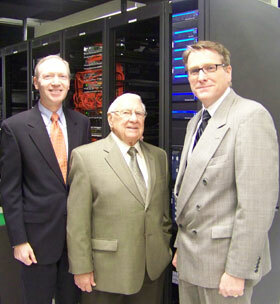 When Detroit Public TV needed to convert to digital broadcasting in the past decade, Bill and Patsy became lead donors, providing funding for the Smith Family Broadcast Operations Center at DPTV. Following Pasty’s death in 2006, Bill made an additional major commitment to name a new studio at the Riley Broadcast Center. “There is an important foundation of trust, civility of discussion, and concern for the improvement of the lives of all viewers that I find unique to public broadcasting and particularly at Detroit Public TV,” said Bill. In this past year, 22 donors have joined the Smith Leadership Circle, committing $2 million, including the Richard C. Devereaux Foundation with a $200,000 gift to name the Energy and Environment Program Fund, and Bill and Shirlee Fox with a $200,000 gift to name the Leadership and Public Affairs Program Fund.